We finally made it to El Chato, after a few failed attempts to go there when the truck was either absent or not open (they seem to get started serving at 8:30 or 9:00). Carmen has driven by this place for months and seen long, telltale lines out front. I had read Bandini’s glowing, credible report on The Great Taco Hunt and had high expectations. 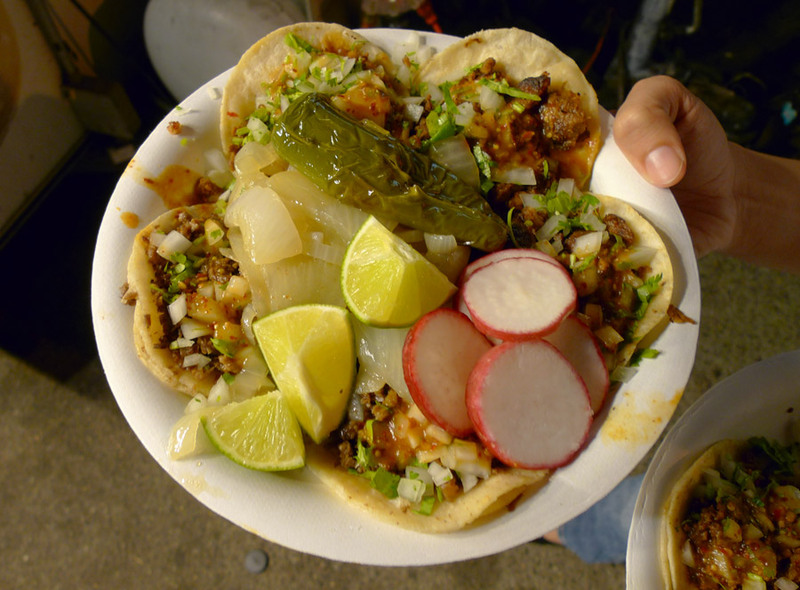 By the way, Bandini has admirably renewed his ambitious goal of eating at all of the taco trucks in Los Angeles, of which there are reportedly over 10,000. To put that in perspective, that’s one a day for 28 years. That is epic. I shakily drove us to the corner of Olympic and La Brea where we saw that the truck was already busy. We were in business. And The Chato proved to be the awesome. It is a good-looking truck with cartoon Cantinflas painted on it and bright, dazzling lights inside and out. Four taqueros were in the little trailer, busy making tacos and burritos. If you look closely at my photo, you might be able to make out the al pastor spit just behind the window. 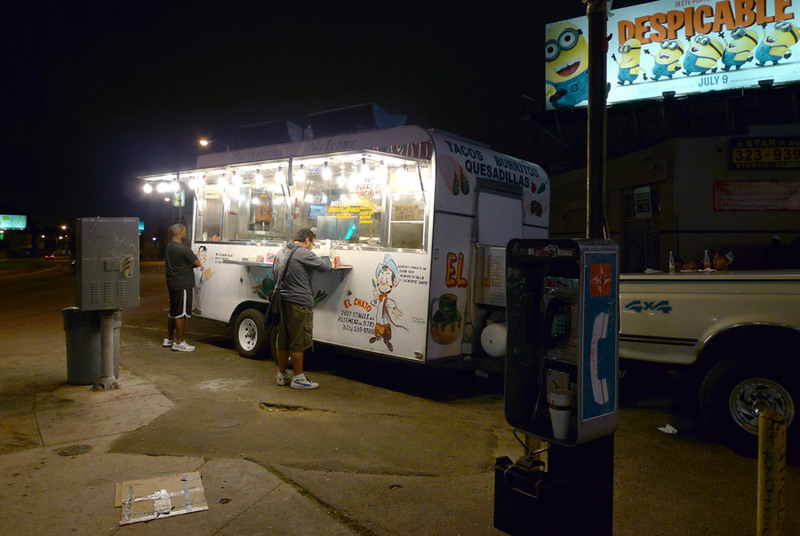 The Chato has a platonic taco truck location, after-hours on the lot of a car repair shop on a busy street corner. I knew from advance research that the tacos would be a bit small, so I ordered five – two each of al pastor and carne asada, and one of chorizo. They are $1.00 each and on the small side, but five of them left me satisfied. We waited for our number to be called. The crowd here is a true Los Angeles melting pot – Latinos, Koreans, African-Americans, Caucasians, and douchebags all visited the Chato while we were there. We got our tacos. My plate, with five tacos con todo, felt heavy. The tacos were nicely arranged, decorated with preapplied onions, cilantro and salsa, and then the plate was topped with a pile of radish slices, juicy key lime tetrahedrons, a big grilly jalapeño, and a heap of tasty grilled onions. I picked up the topmost taco, which happened to be the chorizo. The petite, doubled tortillas had a very pleasing feel – they had been liberally oiled and grilled on a hot plancha. The texture was tough and resilient, not soggy; oily and not dry (as my favorite tortilla descriptor “leathery” implies). The light friedness imparted a slight crispness to these tortillas upon biting into them. They were excellent. And although the whole approach to tortilla preparation used here seems so obvious, so intuitive, this kind of tortilla performance is truly uncommon. The chorizo was delicious, the best taco chorizo I’ve ever had by far. The taco featured crumbly sausage bits salty, spicy, absolutely full-flavored, but not greasy. I might even say that I enjoyed this taco even more than the al pastor, but a little chorizo does go a long way, whereas al pastor is sustainable, good for the long haul. I had the al pastor tacos next, and they were excellent – spicy; good textural variation with resilient bits after a plancha-frying as well as tenderness; pineapple flavor; and a deep porky-flavored subtext. With fine tortillas, good salsa, and fresh grilled onions, these are stellar tacos, genre-defining, honorable. Finally I ate the carne asada tacos. These were great too, although not the standout of the night. The steak is moist and full-flavored, and diced very finely. I found myself picking up tiny little scraps of tasty spare taco meat from my plate after I had finished the fifth taco. El Chato is so praiseworthy that it gives me a warm and fuzzy feeling just thinking about how it’s there, not far away, providing righteous tacos, like true professionals, all evening long for its happy customers.